Who are you? I am sure it has been a while since you asked yourself that question. Now people ask you this question all the time but we give stock answers. We tell them what we do for a living, where we live and what school we went to. They often find out a lot more about us by asking other people. In other words we look at an identity through ritualistic or formalistic ways. If you think about it in the big scheme of things, these answers really do not mean all that much because the only person that can really fundamentally answer who you are is yourself. The funny thing about identity and being true to yourself and discovering who you are in our modern world is that most people allow themselves to believe that they really do not have the time to do this. In fact a lot of people think that this is a luxury that is only available to people with a lot of money and leisure time. Well, there is a lot going on for that argument. It does not take away from the fact that: people, if they truly want to live a fulfilling life, have to ask these fundamental questions because they are the only ones who can answer them. Nobody can tell you who you are. They do not know you. Even if they have an intimate knowledge of your life, for example your lover or your parents, they only know you up to a certain extent. We are all carrying around with us a room that has public views and public depth. This means people can only see into the windows of our souls up to a certain distance. After a certain point, it is all us. The fact that a lot of people do not think about this fundamental question is really a shame because a lot of our anxieties and a lot of the things that hold us back from living the kind of life that we could otherwise be living can be partially resolved by at least exploring who we are. Unfortunately, we tend to play a lot of games with ourselves in terms of definitions and that is what trips us up quite consistently. Here are just some thoughts that I had when I was kayaking. These really opened my mind to the wide vistas of possibilities and opportunities available to me both on a practical, emotional, philosophical level. This is actually very practical stuff if you think about it. When you try to ask yourself who you are, it is very easy to think that your identity is unnecessarily locked into what happened to you in the past, what we did in the past or the consequences of your action from the past. While that does play an important role, it is not the only role. The fact that the past is the past should cue you in to the proper perspective that you should have in terms of defining yourself. If you have only suffered failure, frustration and defeat in the past, it does not necessarily mean that success is off-limits to you. We are all entitled to our past but we should not use it as an excuse to keep reaching for the stars. Moreover, just because something has not happened yet does not necessarily mean that it is impossible. Whether you have a good reputation or not, it does not really matter. The problem with reputation is that people can only can only come up with an assessment based on their own limits. other people’s lives or you read freedom from anger or relief from anger in other people’s lives. Regardless, in this process, you are still reading into them issues that are really your issues. So to say that your identity be in large part determined by what other people say you are, is really missing the point because a lot of that is projection. You cannot rely on that because you might end up living other people’s lives for them. This happens with father son and mother-daughter relationships quite a bit. You are not who you fantasize yourself to be. We are all entitled to our own fantasies. Let us just get out of the way. But the problem is, fantasy is one thing and reality is another. You do have a real identity. Just because you think that you are this or that type of person, it does not absolve you of the fact that you act, think and talk a certain way. In other words there might be some delusion there. You will be surprised as to how many people behave one way and when you talk to them it seems like they actually look at themselves and define themselves in a completely different way. Well, the answer is actually rooted in ancient Greek philosophy. Aristotle himself said you are what you consistently do. I love the genius of this because there is no wiggle room here. When you look at a person’s life, people can say all sorts of stuff about that person. You can come up with all sorts of fantastic notions of who you are but you cannot escape the fact that you behave in a certain way. Keep this in mind. This is one powerful form of realization I had when I was kayaking. This is because kayaking unleashes a long stream of serious moments of truth. When you are there on the river alone or with another friend, you tend to do certain things in reaction to certain stimuli. This is part of who you are. You cannot consistently do this. You cannot help but be aware of them. 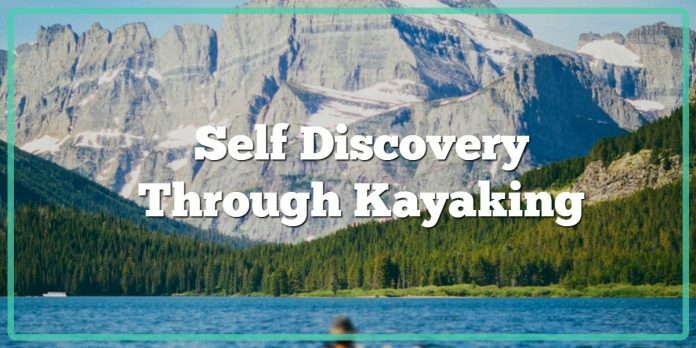 This is why kayaking cuts through a lot of mental, psychological and spiritual fluff. There is really no room for bluffing. You cannot bluff yourself because you have less props. In your normal life, with all those activities and dealings with other people, it is easy to hide behind what other people think you are. It is easy to get consumed by past decisions. But, out there on the river it is harder to do this. There are tremendous moments of truth that really unleashes a deeper consciousness. At the very least you get a long series of opportunities for self-introspection. Again back to an ancient Greek philosophers, they said that an unexamined life is a life not worth living. This is just something to think about.